Can two top predators coexist in the American West? It’s a story about what we have in common — we’re social, adaptable and fiercely territorial. It's also a story about whether we can get along. People have been fascinated with wolves for millennia. They show up in our folklore and in our fairy tales. Today, in much of the American West, gray wolves also show up in our politics. I know this because I grew up in Montana, where wolves can be as important and divisive a topic as gun control or health care. A few decades ago, wolves had been hunted, trapped and poisoned — down to a population of about 50 in the contiguous United States. Then, in the mid-1990s, the federal government decided to bring them back, introducing 66 Canadian gray wolves into Idaho and Yellowstone National Park. They became “the environmental movement poster animal,” says Doug Smith, head of the Yellowstone Wolf Project, a group that monitors and studies wolves in Yellowstone National Park. Biologist Doug Smith at Lamar Canyon in Yellowstone National Park, where some of the first gray wolves were reintroduced in 1995. Since then wolves have thrived: Scientists say there are now about 1,700 of them in the Northern Rockies. And so, after nearly 40 years on the endangered species list, the gray wolf may be removed from the list nationwide. In some places, like Montana, it has already been delisted. Gardiner, Mont., is a small frontier turned tourist town at the north entrance to Yellowstone National Park — and in the middle of the wolf debate. So NPR photographer David Gilkey and I spent a few weeks in my home state with people on each side of the issue, and those in the middle. We found that oftentimes, the debate about wolves is not really about wolves at all. Dozens of wildlife-watchers gather at Hellroaring Overlook at Yellowstone. More than 3 million people from around the world visit Yellowstone National Park every year. 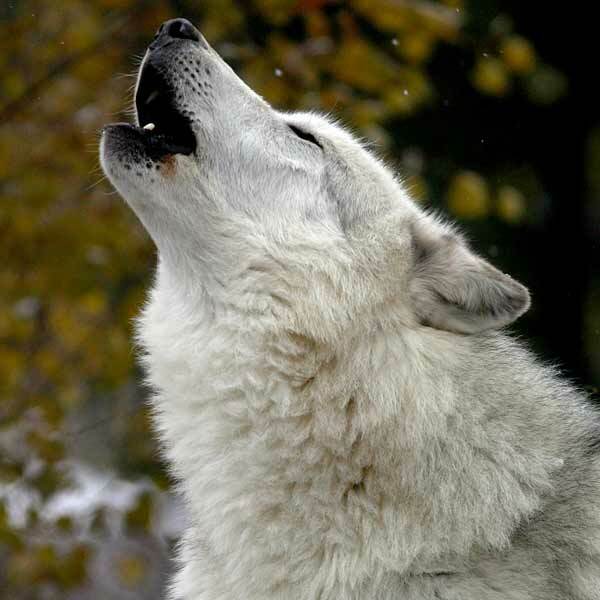 The park is one of the best places in the world to see the gray wolf run and hear it howl. It's estimated that wolf-watching pumps about $35 million into the economies of communities around the park. Field technician Peter Mumford, of the Yellowstone Wolf Project, tracks wolf movements through the park. Rick McIntyre of the Yellowstone Wolf Project speaks to a class of students from Spokane, Wash.
McIntyre has been monitoring wolf behavior every day for nearly 14 years. Children examine the paw print of one of Yellowstone's most famous wolves: No. 21. Bruce Stell, an outdoorsman and hunter, looks for wildlife in western Montana’s Nine Mile area. But 95 percent of the area's wolves live outside Yellowstone. That’s where a lot of the conflict happens. Wolves kill livestock — and the elk that have for so long drawn hunters and tourists to Montana. State officials say wolves killed at least 67 cattle and 37 sheep in 2012, and many more elk. Stell follows a set of fresh wolf tracks up a dirt road. Wolf hunters like Stell had about a 1 percent success rate in previous years. For cattle ranchers, it can add up: The death of one calf can mean a financial loss of about $1,000 or more. Older cows cost even more. For other people, it's more about the elk. In some parts of Montana, like the Bitterroot and Paradise valleys, elk populations have declined. Warren Johnson, who owns Hells A-Roarin' Outfitters, is one of many people who think that is because there are too many wolves. A ranch hand prepares the horses for a hunting outing at Hell's A-Roarin' Outfitters, a small business near Gardiner, Mont., owned by Warren Johnson. Guides at Hell's A-Roarin' Outfitters get ready for the day's hunt. The main target for hunters in Yellowstone is elk. Some hunt for meat; others, for trophy. The state of Montana has responded. To bring wolf numbers down, hunting quotas have been raised, and the cost of hunting licenses has dropped: Montana residents can kill up to five wolves every season, and the licenses are only $19 a piece. But there’s a reason it’s called hunting and not killing: Only about 1 percent of wolf hunters actually succeed. So elk numbers have declined in some parts of the state. But are wolves really to blame? Montana Fish, Wildlife & Parks is conducting a study in the Bitterroot Valley, near the Montana-Idaho border, to find out. The project got a lot of funding from area sportsmen who want to know what's killing the area's elk. Field biologist Ben Jimenez studies elk carcasses to see what kind of animal killed them. It’s kind of like wildlife CSI. Last spring, he and other scientists placed radio-transmitting tags in the ears of 84 elk calves. Each tag sends a different radio signal that Jimenez tunes into. The signal gets faster if an animal dies, and when that happens, Jimenez heads out to find it. Field biologist Ben Jimenez searches for an elk carcass in western Montana's Bitterroot Mountains. Jimenez inspects a half-eaten elk carcass that is buried under a rotting log. Jimenez and other scientists tagged 84 elk calves with ear tags to better track them. So far, the study has found that mountain lions are the primary killers of elk; bears come second; and wolves are a distant third. Still, the debate rages on. Cattle in Montana's Blackfoot Valley makes for enticing prey to the dozen or so wolf packs in the area. Montana's Blackfoot Valley is 1.5 million acres of thick forest and rolling fields. There are seven communities, about 35 ranches, thousands of cattle — and at least a dozen packs of wolves. Surprisingly, though, in 2013 there were no reports of livestock depredations by wolves. Ranchers in Montana's Blackfoot Valley are trying to find new ways of living with wolves. Many scientists believe that, love them or hate them, wolves are here to stay. So some ranchers, hunters and conservationists in Montana are exploring new strategies that might allow wolves, people, elk and livestock to share the land and reach a better balance. One thing they’ve learned: Wolves avoid new things — even a basic strip of flags demarcating territory. It’s called “flaggery,” says Jim Stone, chairman of the Blackfoot Challenge, a coalition of landowners, ranchers, hunters, environmentalists and biologists. Jim Stone, chairman of the Blackfoot Challenge, sets up a temporary fence on his cattle ranch to ward off wolves. Seth Wilson, who works with Stone, inspects the temporary fence as it's unrolled from a four-wheeler. If Stone knows that wolves are in the area, he'll string flaggery around his or his neighbor’s cattle in minutes. It's not as permanent a solution as a gunshot, but he says it can work. Some of the people buying his beef want wolves around, he says, so to him, this is business. Another thing they’ve learned to do: Eliminate the bait. Traditionally, ranchers dispose of dead cattle or sheep in "boneyards" on their land. That can draw scavengers and predators, including wolves. Eric Graham, who works for the Blackfoot Challenge, spends part of his day collecting dead livestock from ranches in the area and taking them to an off-site compost area. The efforts seem to be working. More important, Stone says, they’ve kept the community working together. Montana's Department of Transportation provided a composting area for wildlife carcasses, like roadkill, and domestic carcasses, like livestock. Eric Graham with the Blackfoot Challenge picks up a cow carcass from a rancher in the Blackfoot Valley. He'll take it to the compost site. Graham's job is to bridge the gap between conservationists and landowners. An area hunter gave him this elk head so that he could figure out the animal's age. Hilary Zaranek, a rancher in Montana's Tom Miner Basin. On a ranch in Montana's Tom Miner Basin, Hilary Zaranek is taking her cattle to school. Before marrying into a ranching family, she had volunteered with the Yellowstone Wolf Project. On that job, she observed a few things. She noticed how bison, when threatened by wolves, gather together in a tight herd and keep off predators as a group. So she’s trying to teach her cattle to do that, too. Zaranek tries to herd up a few dozen yearlings. Rancher Hannibal Anderson, Zaranek's stepfather, gathers a stray cow. In much of the American West, the gray wolf is a political issue as important — and divisive — as gun control, or health care or gay marriage are in other parts of the country. The federal government wants to remove the species from the endangered species list. NPR’s Nathan Rott spent weeks reporting from Montana, where wolves are no longer protected, about why these animals stir such deep emotions. Here’s his story.